Linda Watkins’ Ghosts of Mateguas is the third in the Mateguas Island series. While the stories are connected, they can be read as stand-alones. Later books provide sufficient back information so a new reader won't feel lost. This story heralds a return to the infamous Mateguas Island for Dexter Pierce, and for the shattered remnants of the Andersen family. Karen Andersen, now Karen Pierce, returns to the island for the summer, accompanied by her infant son and her husband, Dex. Her daughter, Terri, has also returned to the island to spend the summer with her beau, Shawn, and get hands-on experience with the fishing industry. Bill Andersen, Karen's ex-husband once presumed dead, had returned earlier, purchasing a home and renovating it. Each of these people has returned to the island they once called home for varying reasons. And each has secrets that weigh down the heart. Secrets that will tear them apart. Secrets that have left a few of them just a little off their heads. All of these events form a confluence that sets into motion a waking darkness on the island older than time itself. For much of this story, I was left wondering if the supernatural and preternatural occurrences were actual physical events, or were purely in the minds of the participants. To a degree, I found it to be both. A shuttered mind is unlikely to see that which it cannot comprehend, and an open mind can sometimes be too fertile. I found Ghosts of Mateguas to be a quick-paced psychological thriller/horror story. The various stories that made up the tapestry of the whole were equally engaging, and kept me turning the pages. If you enjoy books similar to Stephen King and Dean Koontz, be sure to check out the Mateguas Island books! Ghosts of Mateguas is the third novel in the Mateguas Island series by Linda Watkins, a gripping story of a family in quest of redemption, a story of mortals and ghosts. In Scarborough, people have been disappearing over the years, with no one knowing what happened to them or where they went. When the corpse of a young girl is found on the waters, Karen knows it’s time to trace the mysterious killer. Will she and her family be able to tame the ancient ghosts of Mateguas this time and put them to rest, bringing peace to the land? Those who love stories with some touch of mystery will not be disappointed with this one. The story, for sure, will grip readers at different levels. First off, Watkins writes with moving simplicity, a kind of prose that tantalizes and is difficult to put down, because it rings with an eloquence that is akin to the spell of the ghosts sauntering along the rocky shores of Mateguas. It can be difficult to believe a story told about humans and ghosts, but when that story is told by Watkins, it becomes as convincing as it is real. The setting is perfect for a tale that involves the herald of evil: the rocky shores, the eternity of the sea, the marshes… The story is fast paced; the suspense is so skillfully built into the story to have the reader turning the pages, and the characters are solid enough that any reader will care about what happens to them. One would say that Ghosts of Mateguas comes with a spell that makes the book impossible to put down. Beautifully written by a writer of a rare caliber. Ghosts of Mateguas: A Mateguas Island Novel is a supernatural suspense novel written by Linda Watkins. Dex Pierce and his wife, Karen, are getting ready to move back to Mateguas Island for the summer, along with their one-year-old son, Alex. Karen would really rather stay in Monterey, California; however, Dex's business interests are a major reason for their travel plans. Both Karen and Dex are worried about the fact that Karen's ex-husband, Bill, is living on the island. Bill is still suffering from the ordeal he endured when he was knocked unconscious and left for dead on uninhabited Puffin Island and his later stay as an amnesiac in a mental hospital. He’s obsessed with getting Karen to return to him and will stop at nothing to do so. Bill's never gotten over her leaving him, and the intensity of his emotions makes Dex nervous and suspicious of any interactions between his wife and her ex. Karen has other reasons to stay away from the rustic and beautiful island off the coast of Maine. There are powerful supernatural forces residing on Mateguas Island, and the strange golden flecks in her infant son's eyes have her wondering if he is The Blessed Boy. Linda Watkins' supernatural suspense novel, Ghosts of Mateguas: A Mateguas Island Novel, is dark, fast-paced and intense. 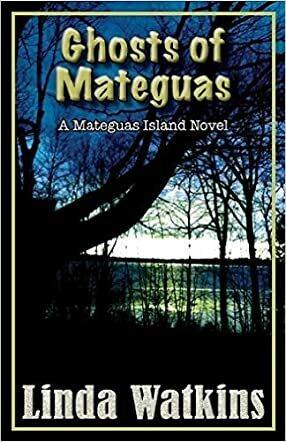 This is the third book in Watkins' Mateguas Island series, and, while it can be read on its own, I strongly recommend that the reader begin with the first book in the series, Mateguas Island, to get the full impact of this powerful series. I enjoyed seeing how the author builds on her earlier works and keeps the energy and dread building. Karen continues to be a plausible main character whom the reader can't help but empathize with as she battles some extraordinary and terrifying dark forces, and tries to contend with her obsessed ex-husband and his unscrupulous reporter girlfriend who are each determined to assassinate Dex's character. There's a marvelous Native American influence at work throughout the story, as well as appearances by a local healer and midwife. I had a grand time reading Ghosts of Mateguas and hope the author decides to write a fourth book in this terrifying and suspenseful series. It’s most highly recommended.